As spring training approaches its end, I have had the opportunity recently to speak with a few Phillies prospects to talk about their status and how the exhibition season has been going. A trio of hurlers took time to speak on various subject and those pitchers are Mario Hollands, Tyler Knigge and Nick Hernandez. Leading off is last year’s opening day starter for the Class A Lakewood BlueClaws, Mario Hollands. The left-hander, was selected in the 10th round of the 2010 draft. 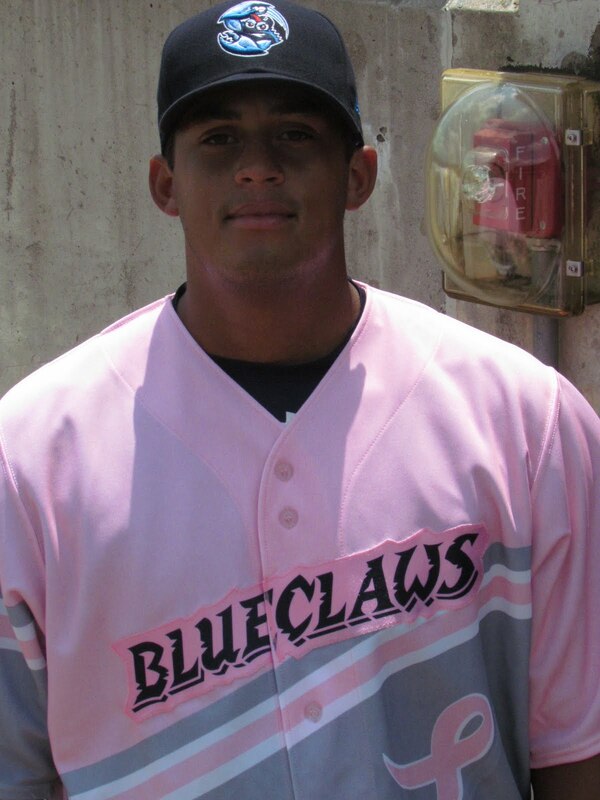 Last season, with the BlueClaws, Hollands posted a 6-6 record with a 4.24 ERA in 28 games. Hollands improved his efforts after a switch to the bullpen. Read ahead to learn what Mario told PhilliesNation writer Jay Floyd about the dreaded spring training “walk of death” and plenty more. JF: How would you assess spring training to date? What have you taken from these past few weeks? MH: I’m really happy it’s almost over. It’s a long road for everyone. But besides that, with all the changes in personnel, I’m happy to come out with a job. And I’ve been able to work on different pitches and just being able to improve them. Fine tuning some pitches before the season starts….just the little things that I’m able to work on each day has really helped out. JF: You mentioned being happy to still have your job. With guys who seemed to have a firm lock on their spot, like Eric Pettis, getting cut, it really seems like almost anyone could go at any time. I spoke with Brian Gump, a player that was released last week by the Phillies, and he described entering the facilities each day as “a walk of death”, as guys are unsure if they’ll be requested to go talk with the brass and receive bad news. How stressful is it for players to walk into that on a daily basis? MH: That “walk of death”, as Gump called it, is easily the scariest thing I’ve ever faced, or anything I’ve come across. It’s so intimidating and the walk is so far and you can see (the coaches) ahead of you and for 45 second (as you walk), you don’t know if they’re going to ask you to come off to the side or if you’re going to get to just keep walking by them. It’s absolutely terrifying. I’d have to say that applies for everyone. From first rounders to recently drafted kids, it’s the worst thing. It just makes for a horrible morning. It actually just turns into horrible days because (when guys are cut), you have to say your goodbyes to all these guys that you might not see again maybe, ever, or for a long time. It’s just a horrible time of the year and I think…there’s still one more cut and everyone’s just dreading that morning. JF: What are your expectations for yourself early this season and then later in the year? MH: Early on I just really want to establish myself in the bullpen. Of course, I just want to get off to a really good start and hopefully that just translates to more success throughout the season. Everyone really wants to end (the season) at a level higher than where they started (the season). I think that’s everyone’s main goal, but I just want to continue to pitch well and get better as a reliever because I haven’t been doing it that long. JF: In relation to that, I know last year you began the season as Lakewood’s opening day starting pitcher and you moved to the bullpen just before mid-season. How would you describe your transition over the last 12 months? MH: I think relieving and starting are just really different and actually, well, I’ve had time to focus on relieving, but prior to that I had always been a starter. It’s just a much easier transition, coming from college- starting in Williamsport, starting in Lakewood, including opening day, it’s been a different transition for me. You don’t have to worry as much. There’s a lot of- I can’t say stress- but you don’t have that same pressure. Next up, I spoke with righty reliever Tyler Knigge. The 12th round pick from 2010 had a solid season out of the Lakewood bullpen last year, posting a 4-3 record with 4 saves and a 3.32 ERA in 43 outings. 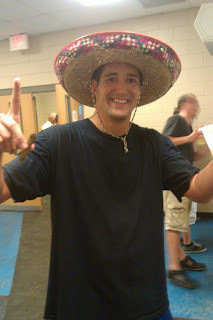 Expect Knigge and his mid-90’s fastball to pitch with the Class A Advanced Clearwater Threshers in 2012. JF: You showed up to spring training considerably early. Can you describe the advantages in doing that? TK: Being from Idaho and being in the cold weather and everything…it’s a lot different being able to go down early. My first spring training, I didn’t have the opportunity to go down early, but this year I had the opportunity to come down about 18 days early and work out and get into the warm weather and really become acclimated, which really helped me to loosen my arm up and I was able to get into the- we have a new conditioning coach, and I was able to get into the conditioning program and that has really helped me out preparing for the spring training aspect. JF: What do you think is the most appealing thing about Clearwater? TK: The weather is definitely one of the better aspects of playing in Florida. It’s definitely better to pitch in the heat. Being a pitcher, I would say, especially me, I like being able to feel loose, and get comfortable on the mound. My first year in professional ball, I played with the rookie ball team, here in Clearwater and, so, I’m used to the weather. It’s something that I enjoy pitching in. JF: I’ve spoken with guys before that say they’ve struggled at times with the humidity down there during the hotter months. Have you run into any great troubles in regards to that and dealing with grip issues? TK: The first year I was here, in the GCL, I did have some trouble finding grip on the ball, but baseball gods were so kind as to bless us with this little invention called rosin. And I had never used it before, being from Idaho, where any heat that you get is dry, and I never had a need for it until I got to Florida. About two appearances into my professional career, I decided, “Well, throwing a 94 mile an hour fastball halfway up the screen behind home plate isn’t gonna get me real far.” With issues holding onto the ball, after a while I decided to use some rosin and I haven’t had any problems, since I started using that. And lastly, Hernandez, a 12th round draft pick from 2009, has been recovering from shoulder surgery last year. In his time as a pro, aside from his four rehab outings with the GCL Phillies in 2010, in which he struggled, Hernandez has posted tremendous numbers with an 11-2 record and a 2.25 ERA in 23 starts. When I spoke with Nick, who expects to join a roster in June, he addressed his progress and more. JF: Where would you rate your health right now and what are you working on until you can throw from a mound? NH: Health wise, I feel I’m about 80-85 percent right now. I still have some arm strength and stamina to build up in my shoulder but that will come within the next month or so. JF: Since you’re not game-ready yet, what is your routine typically like right now? NH: I come to the field, do my shoulder exercises and then go out and throw with the guys when they go out. After throwing, I usually have some manual therapy on my shoulder/scapula area and then do some kind of a workout, whether it be upper body or lower body. JF: Is there anybody within the organization that was extra supportive or that served as a motivator during your down time? NH: Definitely. Some of the guys have definitely been extremely helpful. The training staff has been incredible during the entire process, and then players within the organization have pushed me to find different things to get me better. Two guys especially have really been helpful and that’s Mike Nesseth & Jonathan Pettibone. They’ve pushed me during spring training especially and have always told me that I’ll be on a mound again, even when I’ve had days that I’ve thought there was no way I’d ever pitch again. And I’m very thankful for them and everyone who has helped me.